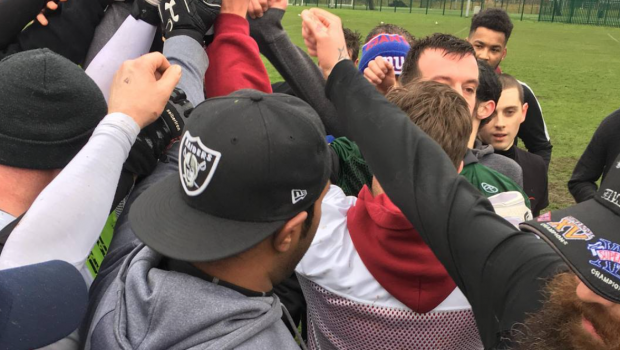 American football is growing rapidly in Britain and it’s doing so right in front of our eyes. With the overwhelming success of the International Series, the National Football League now claims to have more than three million ‘avid’ UK fans. This got me thinking, as one of those avid fans, wasn’t it time I give it go? After all, how hard could it be? 68 adult teams compete in three tiers in locations spanning the length and breadth of Britain but one team in particular caught my eye — the Leicester Falcons. I live in Leicestershire, so geographically they made the most sense and they compete in Tier 2, so in my head, they seemed a perfect fit. Rather fortuitously, the Falcons were holding Saturday ‘try outs’ for veteran and rookie players at Fullhurst Community College, just a stone’s throw away from my beloved Leicester City’s King Power Stadium. Rugby wasn’t my sport growing up, so would I get smashed to pieces, or could I call on my cricket background to cling on to some one-handed stunners? In my head I was going to be the Odell Beckham Jr of British gridiron. In reality, I’d be lucky to come home in one piece. Saturday was upon me, and so was the anxiety. Would I be made to look like a fool? I weigh 75 kg, have no oval ball background and little idea about the sport’s intricacies. Alas, after a motivational speech from the mother, which would rival the likes of Martin Luther King and Sir Winston Churchill, I was ready. Thanks to mum, I now knew just how the people of France felt after Charles de Gaulle’s rousing ‘Appeal of 18 June’ speech summoning the resistance. Picture this. Your stereotypical sports playing field in January. Bare, lifeless, rock hard and a skinny lad (me) standing there in nothing but a t-shirt and shorts. This wasn’t going to end well. As I jogged over I was immediately greeted by one of the coaches who asked, “Veteran or rookie?” “Rookie,” I said and was pointed in the direction of what looked to be a pack of lost individuals who, like me, were wishing they were sitting in front of the fire at home. I introduced myself and it became clear rather quickly that we were going to be part of a ‘rookie only’ practice session. We were asked what positions we wanted to play. I opted for wide receiver, so we split up into groups based on those positions. The drills were basic. We’d run a simple slant route and take a catch from the coach, acting as the quarterback. My handling was good, as I expected it to be, but what I didn’t have was breakaway speed. Many of the guys were in fact speedsters, but didn’t have the handling skills which I guess, levelled the playing field. The second hour of practice was by far the most enjoyable. Our opposite numbers, the rookie cornerbacks, joined our group as we played ‘mini games’ of seven versus seven. The objective was simple. Beat your man, get into space and make a catch from the quarterback. Space however, was hard to come by. Due to the small area we operated it, to say it was congested would be an understatement, but with a shimmy or two, I finally managed to get the hang of it. The highlight of the day was when a ball was inadvertently tipped by another receiver and I clung on to a one-hander right under the gazing eyes of my opposite number who, to be fair, gave me a nod of approval. As practice came to an end, we headed over to the much larger group of veterans where the session was ended by a team huddle and some feedback from the coaches, which was, in the main, very positive. It wasn’t until I got home that I started to reflect on my day. What didn’t strike me at the time, but did hours later, was the fact that complete strangers engaged in a huddle just a few hours after meeting each other. Why doesn’t this happen in other sports? My thoughts are that because the sport is so physically demanding, respect between players is immediate. For those, who like myself, may be anxious about trying American football, don’t be. Give it a go. It may just surprise you. Oh and Odell, I think you’re safe. For now, anyway. To find an American football club in your area, visit the britishamericanfootball.org website.